During a recording career spanning almost five decades, David Bowie released 25 studio albums, two albums with Tin Machine, nine live collections, six EPs and 120 singles. Jamie Jazz, The King Blues/Bleach Blood: “What can I say about David Bowie that hasn’t already been said? Something about his back catalogue of simply amazing, genre-defying songs or his influence on the world of music, theatre and fashion? Maybe his uncanny ability to reinvent himself and be able to stay one step ahead of everyone else throughout his illustrious career? I could even touch upon his influence on me as young man confused about his overly feminine ways in the dying days of how a ‘man should be a man’ and how seeing Bowie’s disregard for obeying traditional gender roles made it OK for me to be a total weirdo in the eyes of others. Fish: “In the 70’s, I more or less turned my back on the then fashionable glittery glam rock but always had an ear on David Bowie. When I went to Aylesbury to join Marillion in early 1981, I couldn’t help but become aware of his history with the town as his first gigs were at the local Friar’s club and it was there that Ziggy was born. I was then a young Scottish singer on the threshold of the dream, but on those long dreary unemployed days, I’d often find myself camped up in a small cafe with the bass player cadging free coffees from the owner, a huge Bowie fan, who in return for his generosity would brainwash us into the Cult of Bowie by playing his vast cassette collection on the cafe’s tinny sound system. That was when I began to realise what an outstanding songwriter he was, and for me more importantly, a brilliant lyricist who would become a large influence on my own writing. Wayne Hussey, The Mission: ”There are literally hundreds of great songs I could have chosen but I thought I’d go for this one. It came out at a time when Bowie’s star wasn’t flying quite as high as it once had or would again. To me, it was clear from this track, which was originally released on the Outside album, that Bowie was searching and probing the musical landscape for rehabilitation. His voice is incredible on this – as it almost always was – and I love the way the music is skittish and deranged (as in the title), whilst his relaxed voice kind of floats above the mayhem. And what an opening line: ‘It’s funny how secrets travel’. Ben Ward, Orange Goblin: “As a kid, David Bowie used to freak me out and interest me in equal measure – and I think that was the point. My first memory was seeing the creepy video for the song Ashes To Ashes with David wearing a Pierrot-style clown outfit walking towards the camera in a funereal style. That struck a chord with me and I grew up surrounded by his music. It was everywhere as a kid in the early 80s: on the radio, in the pubs and on Top of The Pops – and I liked it all. 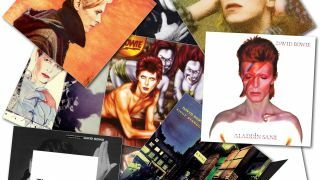 As I grew older, I started to explore his older material and fell in love with albums such as Hunky Dory, Aladdin Sane and Ziggy Stardust… but it’s the album The Man Who Sold The World that I love the best.